The new What's in the Bible? Church Edition is now available at KIDMO.com! 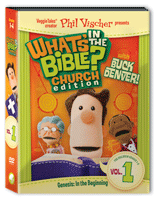 Based on the bestselling new consumer DVD series from VeggieTales creator Phil Vischer, What’s in the Bible? Church Edition is designed specifically for classroom use. It incorporates many of the same elements of the DVDs, but has been built for churches by leading curriculum experts. You can also pick up consumer Vols 1-4 of the What's in the Bible? Series from KIDMO! Just look for the What's in the Bible tab at the top of the KIDMO homepage!